detection and action is critical to avoid substantial loss and or devastation. The Projex Group addresses project recovery at both the organizational and individual project levels. Based on your specific need we provide three service offerings to help your organization get your projects back on track as quick as possible. 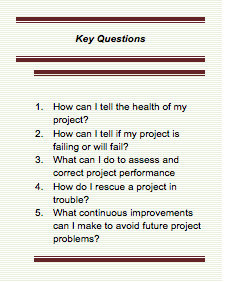 Develop and implement a Project Rescue & Recovery Plan. Define most effective way to proceed with the program and or project. Mentor and coach throughout the process. Capitalizing and institutionalizing Lessons Learned can dramatically reduce repeat mistakes. The Projex Group will help you establish and maintain the process for capturing, evaluating, and institutionalizing lessons learned to improve performance across all projects. To find out how The Projex Group can help you get your projects back on track and avoid costly mistakes contact us today. We have the answers to the above questions!